CSIRO climate modelling indicates rainfall levels in North Queensland will hold at current levels for the next 30 + years, while southern states will experience a reduction of 15% . This may cut back surface irrigation water by approx 35%. There will be a 4 to 5% reduction in water availability in the Murray Darling Basin with a mild climate change and a 16 to 25% reduction in a moderate climate change scenario (2 degrees C by 2030). Expected run-off reductions in specific basin rivers is significant – Murray 13%, Darling 11%, Warrego 7%. The Murray Darling Basin receives only 6% of Australia’s rainfall but contains 42% of the nation’s agricultural farmland, producing 40% of the nation’s food, 90% of which is irrigated. Over 70% of Australia’s water use is devoted to irrigation. The basin accounts for 65% of Australia’s irrigated land and 66% of Australia’s agriculture water use. Alternatively, it has been estimated, west of the Great Dividing Range in North Queensland, the annual surface run-off (excluding groundwater) is 126 million ML, nearly one-third of Australia’s annual run-off. The Murray-Darling Basin has an annual run-off of approx 22 million ML. In each of three recent years (07/08,08/09/10/11) twice as much Burdekin River water flowed to the sea as the whole of the Murray Darling Basin uses in a year. 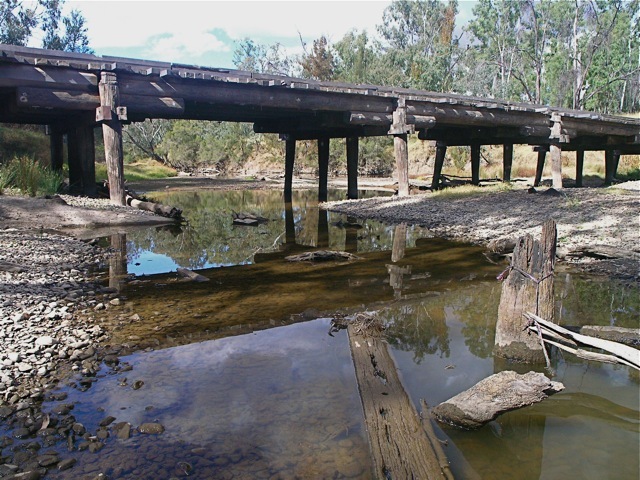 In 1997 a Queensland Government Water Infrastructure Task Force commissioned an engineering assessment of northern water storage options west of the Great Dividing Range and discovered 11 possible sites, most of them in the Etheridge Shire. In 2003 Geo-science Australia conducted a study on one aquifer in the vicinity of the Gilbert River Formation, west of the Divide, prompting suggestions by some, this may provide storage for 20 million ML alone. It is thought such aquifers within the Great Artesian Basin contain the largest storages of water in the northern region and are rapidly recharged during rains. Further, there is some justification for utilising this through-flow in an aquifer which would otherwise be lost to sub-marine ground water discharge into the Gulf of Carpentaria (provided spring discharges are not compromised and seawater intrusion in the aquifer is not encountered). Two storage facilities east of the Divide have been the subject of continuing assessment over the years. The Burdekin Dam spans Australia’s third largest river and stores 1.86 million ML with an annual flow of approx. 10 million ML. Proposals for a stage two increase in storage capacity to 8.5 million ML and the introduction of a 37MW hydro-power facility below the dam wall (generating sufficient power for 9,500 homes annually) are subject to assessment. Upstream from the Burdekin Dam is a proposal for the Hell’s Gate Dam 100m wide in a deep narrow gorge capable of storing 5.72million ML and also having optional hydro-power facilities. A Hell’s Gate Development Council consisting of representatives from all levels of government found there were many gorges in the northern part of the Great Dividing Range (both east and west of the range) capable of being dammed. The Richmond and Flinders Shires (Hughenden) have active proposals for dam storage facilities capable of being incorporated in our proposals. True ownership and entitlement to water is a complex issue to be resolved and simplified in the Australian mindset. We understand the constitution leaves the responsibility for land and water management with the states. This study will serve to identify all and any issues to be addressed in the ownership and supply of water under the plan, a preliminary assessment of the legal and financial management of a national resource. – emerging needs relating to food, carbon farming, alternative energy research, mining and service industry operations critical to the nation’s economic stability. Water is a primary amenity stimulating community settlement, enjoyment and recreation, attracting worker / residents from the coastal strip. It also provides a tourism amenity. Control of water near the source will ensure a release regime geared to seasonal cropping needs, native fish breeding cycles, wetland replenishment for migrating birds, vegetation needs along flood plains and minimal impact on river structure and biodiversity. A case exists for a network of limited impact / smaller footprint dams located west of the Great Dividing Range, harnessing a percentage of surface run-off for injection into chosen storage aquifers. These dams would be spread across various catchments and varying climatic events, drawing smaller volumes of water from any one location while safeguarding the environmental flow at the source. Each dam, its’ catchment and water quality is managed by a convened local industry group. It is expected some dams might service both local and national consumption needs. Others may be detention holdings only, simply to meet the function of water release regimes. Some catchments have small areas where the soil and water configuration is suitable for agriculture.